Wow, you all really enjoyed the How to Crochet: the Sidewalk Shawl video. Thank you for all the kind words regarding that video and the chart! I just knew many of you (including the designer herself, Kimberley McAlindin) would appreciate a chart for this fantastic pattern. It makes it so much easier to follow along, right? Well, incase you are not exactly sure how to read the Sidewalk Shawl crochet chart for this pattern I’ve done another video tutorial to walk you though some simple steps on how to read the chart and use the written instructions to ensure success. 3. Watch the video and let me talk to you about reading the chart. Now you are ready to gather your materials, watch the video for the Sidewalk Shawl and get started! If you have questions please don’t hesitate to ask me and I will help you as much as I can. I can’t wait to see all your projects! Thank you for this lovey pattern and the chart as well. I love chart patterns. I create them myself, if it is not supplied with the crochet pattern; it makes crocheting go faster! I don’t understand how anyone would have trouble reading charts; they are so SIMPLE. And, for the other person below, this IS a PDF file and does download. 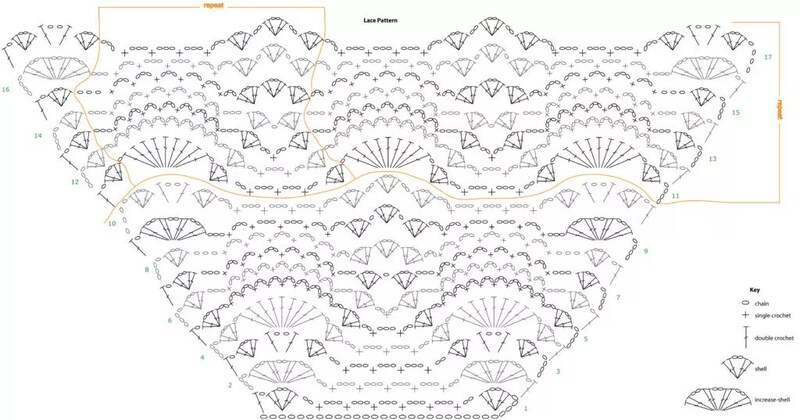 Thanks for the PDF chart for this beautiful pattern. The chart downloaded quickly and easily (I love Dropbox!) and opened with no trouble. I LOVE LOVE LOVE CHARTS SOOOOOOOO MUCH EASIER THAN READING ALL THOSE ABREVIATIONS! SINCE I HAVE DISCOVERED CHARTS I’M ON FIRE FOR CREATE ANYTHING I CAN GET MY HANDS ON! THANK YOU! LOVELY SHAWL! I love this shawl and was making it for my sister’s birthday but I had to stop after row 17 because I don’t understand the chart or the written directions where it says’ for rows 18-45: Repeat rows11-17 four more times’. If you follow rows 11-17 as they are printed, they don’t increase the shawls width. I think you said to repeat the repeat on another site but I don’t understand what that means either. Is there a site where all the directions are printed out including rows 18 thru 50 or even 18 thru 25? I just need a little help understanding how the rows are crocheted. By what mechanism are the rows increased? Is it ‘repeat row 11 2 times from start to finish then repeat row 12 3 times from start to finish. I don’t know why I don’t get it. I don’t get it either Niki. I really wish Marly Bird would answer your question publicly so we could all move forward on this project. Hello, the link (tried 4 different ones) to the chart is not working. It says it has been moved/deleted. Is it possible for you to upload it again? Thanks in advance; I look forward to making the shawl. So sorry about that. I had an issue with dropbox. It should be working now.